Obtaining a Russian visa can be a long and expensive process for US citizens, especially if you actually reside outside of the United States like us. To be completely honest, the process was extremely frustrating for us. We tried using the regular United States Postal Service at first instead of expensive international FedEx, only further delaying the process. We weren’t aware of quirky little extra documents that needed to be completed because we live outside of our home country and at once point our documents ended up in the Philippines instead of Washington D.C. where they were supposed to be headed. But lessons learned and two shiny new Russian visas in hand, we’re incredibly excited for our trip. 1. Get a Letter of Invitation. Also known as a LOI or Visa Support Letter, you’ll need one to apply for a Russian visa. Lucky for us, G Adventures provides the Letter of Invitation for travelers going on their small group trips to Russia. So, obtaining the Letter of Invitation was easy and included in the price of the trip. There are also many travel agencies that will provide a Letter of Invitation if you decide to go on your own. Other travel friends have used Real Russia and found the service to be fast. Consult their website for prices for visa support. 2. Check your official Letter of Invitation. Unfortunately for you, your Letter of Invitation will be in Russian. Because I can’t read the Cyrllic alphabet, I didn’t notice that my Letter of Invitation listed my nationality as Canadian and not American. Check that your Letter of Invitation does have the correct information. Google Translate is very helpful in translating from English to Russian in order to verify your information is correct. 3. Gather all your documentation needed to apply for your Russian visa. The Russian visa application must be completed online, but before you’re ready to do that, you’ll want to make sure all your proper documentation is in order. Your US passport must be valid for 6 months beyond your stay in Russia and have at least 2 empty pages available. The pages in the back that are marked “for visas” do not count as empty pages. You’ll need 1 recent passport type photograph per application, in color, front view and with a plain/white background. Glasses should not be worn in the photo unless the photo in the original passport includes glasses. An official Letter of Invitation to visit Russia. Our official Letters of Invitation were provided by G Adventures through the vendor Palladium Travel. If you are a US citizen living outside of the United States for any reason, you’ll also need to include a letter addressed to the Consulate General of Russia explaining the circumstances of why you live outside of the US. Sign the letter with blue or black ink and include it with your application package. No where in any of the documentation about completing the visa application was the it noted about the letter to the Consulate General of Russia. Not including the letter in the original packet of paperwork resulted in about a 2 week delay of the processing of our Russian visa applications. 4. Complete the Russian visa application. a list of the countries you’ve visited with the dates of your visit over the last 10 years. You must also have health insurance and most health care plans provided by your employer do not cover you outside of the United States, so look into travel insurance. You must apply from your home country. If you’re one of the lucky ones that lives in or near Washington DC, New York City, San Francisco, or Houston, congratulations! Obtaining your Russian visa just got easier. You’ll be able to make an appointment to pick up your visa in person. Note that you still submit everything online. If not, welcome to the hellish process of obtaining a Russian visa! Okay, I may be exaggerating slightly. If you follow the tips above and make like Santa Claus, checking your list twice (quadruple), then you should only be separated from your passport for about 15 – 21 business days. You’ll need to hire a Visa Agency to pick up your passport and visa for you. The Russian Embassy lists Travisa on their website as the designated processing agency in the United States. I was slightly frustrated with Travisa. We had to resubmit a corrected application and the aforementioned letter explaining our status living outside of our home country (not their fault), but after getting all of that documentation re-sent (because everything must have an original signature in ink; no scans or PDFs! ), the representative processing our documents noticed that my LOI had my citizenship listed incorrectly. My Letter of Invitation had to be re-issued, holding up the process and calculating if we’d even receive our visas in time for our trip at all. I felt Travisa should have caught this error when they first received our packet and reviewed it. According the Russian Embassy, you can submit your application for your Russian visa up to 90 days before your entry into Russia. We were traveling in Greece, so we submitted our application online exactly 60 days prior to our entry into Russia. If you don’t live in a city with a Russian consulate and especially if you do not reside in your home country, assume the longest processing time possible and submit your application as early as possible. Also note that Travisa will only FedEx your passports and Russian visas to an address within the United States; they do not provide international services. You’ll need to factor in additional time for a friend or family member to receive your Russian visa and then send it to you. We received our Russian visas a mere 9 days before our flights and were sweating bullets over it. A Russian visa isn’t cheap. We spent around $650 for two visas and the assorted fees. Here is the cost breakdown per person. We also had additional mailing fees when sending our documents to Travisa and then international FedEx priority from the United States to Italy, which will vary location-by-location. Wow! I reckon that’s enough to put most people off ever going there! What a hassle! I don’t envy American travellers. When I was in South America, they had to get loads of visas that I didn’t need, and it must have cost them a lot too. Congrats on actually completing the process, and have a fantastic time. I hope it was worth the effort! I think that just might be their plan! 😉 Even though it was somewhat of a hassle, I was still never put off. We really are looking forward to our time in Russia! This sounds so familiar! We once tried to get a Russian visa but we failed miserably because we weren't in our home countries but in Ukraine where they refused to let us apply due to not Ukrainian citizens. Fair enough! We learnt our lesson now, there are some things like getting a Russian Visa that need to be planned in advance. This sounds so familiar! We once tried to get a Russian visa but we failed miserably because we weren’t in our home countries but in Ukraine where they refused to let us apply due to not Ukrainian citizens. Fair enough! We learnt our lesson now, there are some things like getting a Russian Visa that need to be planned in advance. Yes, Russia isn’t a country you can just visit on a whim. Much advance planning is required! A couple additions/corrections – Seattle also has a consulate, so people can go in person there. Also, as I mentioned to you before, if you have residency in a country other than your home country, you should be able to apply in that country. Italy has Russian consulates in multiple cities, so I still maintain that your whole process would have been easier if you would have gone in person to a consulate in Italy. You would have been able to talk to someone in person who would have caught any errors so you could have fixed them much quicker. Also not sure why you had to pay $175 for your visa fee unless that is a very recent change – it is typically $140 for a tourist visa or $160 if you get the new 3 year multiple entry one that’s available to Americans. I’m sorry you had such a hassle getting everything and I hope you’ll find Russia to be worth it, but I really believe some of your issues could have been avoided. We’re not residents of Italy and it would not have been possible for us to apply for our visas from Italy. We had no choice but to apply via mail in the US, or just not to go at all. The fees must have gone up as the fees are quoted for visas right on the website and they are $175 for a single entry visa. Certainly some of our hassle could have been avoided. Looking back, we should have just paid to FedEx our documents to begin with, though that would have added $80 for each time we had to mail anything. We also didn’t know about the letter to think to use Google translate to ensure our LOIs were correct. I definitely think it will be worth it. We’re super excited to go! Challenge accepted, Frank! We’re super excited for our visit and both have always wanted to go. We’re kicking ourselves that we didn’t apply for the 3 year multi-entry visas. We’ve really liked the parts of Eastern Europe we’ve been to! I don’t know much about Russian food besides blinis , caviar, and vodka but I’m excited to discover local cuisine. Good information to have – I’ll bookmark for “someday” purposes! Good grief! We plan to visit Russia once we’re settled in Latvia and I am not looking forward to this headache. It will be worth it in the end, though. Enjoy your trip!! It was totally worth it! Russia is just different and we did have a good time on our trip. Posts all about our trip coming soon! Hopefully it will give you some ideas for when you go. Makes me so happy that i can go to any travel agency in Lithuania armed with my passport and a photo and in a week’s time I would have a Russian visa. That does sound like an easy process. Not so much for other nationalities though. Wow, you’ve pretty much covered it all. Not going to Russia anytime soon but bookmarked this for future trip. Can’t wait to read how you’re experiencing Russia. Cheers. We’re just back from Russia and we had a great time! We’ll have tons of tips over the next couple weeks like how to use the Moscow metro and tips for the overnight train. St. Petersburg was our favorite of the cities and villages we visited, but Moscow is not to be missed for St. Basil’s, Red Square, and the Kremlin. Such beautiful buildings! I got stressed out just reading your post! As someone that worries about everything when planning travel, I so feel for you! I’m getting nervous about applying for our visas to visit China in November. I can’t wait to read about your travels in Russia. The architecture is so spectacularly different, I would love to see it in person. The architecture was indeed spectacular. 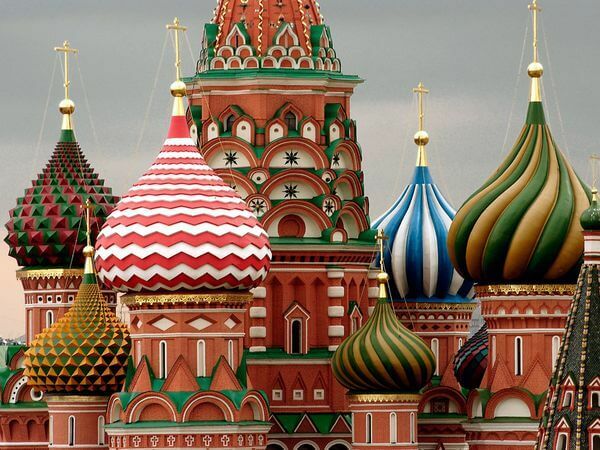 I’d seen pictures of St. Basil’s and other famous buildings, but they still didn’t prepare me for what it would be like to see them in person. The colors and the style are just incredible! All the stress of the visas was so totally worth it. Wow I never knew it would be such a tedious process! I’d bookmark this for future use! Tedious for sure, but now having been to Russia, it was totally worth it! wow, that’s seriously a long process. That probably stops most Americans from travelling there at all. Americans do have the option to visit St. Petersburg on a cruise without obtaining a visa, but you’d miss out on so much doing it that way! It’s a long process, but we feel it was worth it as we had a great time. Oh really? We have quite a few friends that live in London and it was a piece of cake for them to get the Russian visa. I was quite jealous! My visa arrived, like yours, without a photo attached, even though I sent a photo in with the application. Did you get into Russia without attaching a photo to it? I’m leaving tomorrow morning and getting worried. Thanks! Yes, they scan the photo into their system but don’t attach it to the visa in your passport. No need to worry! Just be sure to make copies and email it to yourself. It’s good to have the copies of both your passport and visa easily accessible just in case your passport gets lost or stolen. Wonderful. Thanks for the quick reply! Hi, I just came across this as I’m trying to figure out how to get my Russian visa from abroad. I’m an American currently living in South Korea and I wanted to get my Russian visa to do the trans-siberian when I’m finished. There are consulates in Seoul and Busan, but are you sure I cannot get my visa from there? If not, will I just have to use a travel agency? Any help or advice would be greatly appreciated. Thanks. Yes, there is only one company Americans can use to get a Russian visa. It’s Travisa, which we linked to. I just checked the website and there are only a few locations in the US where the application can be processed. Plus, the service will only mail it back to a US address. Since we also live abroad, we mailed our passports and applications to the service and then had them send the completed passports and visas back to my parents, who then sent it to us in Italy. It’s a total pain! You can try inquiring at the consulates there, but I was told that going through Travisa was the only way. Good luck and let us know how it goes! did you manage to get your Russian Visalia in South Korea? Thanks for sharing, Alice! I had a look and the key to the article that you shared is that it is written for Americans applying for Russian visas in the US. As we said, it is much easier if you are an American living in the US. But for Americans expats like us that don’t live in our home country, it’s a far more complicated process. Hi Jennifer! I’m going through this same thing now as an american currently living in Italy. It seems like I can apply at the visa center in Milan. Did you have a permesso di Sogiorno? I’m thinking no, and that’s why you couldn’t do it here, but since I do I think I can. Thanks for your help! Hi Rebecca, yes I had a permesso di soggiorno and was a full legal resident of Italy. Things may have changed, however, applying with our US passports required that we did so in our home country. Good luck and let us know if you are able to apply in Italy.